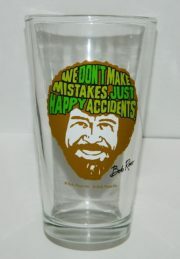 This is a new and unused 16 ounce clear pint glass with the art image of the face of the late Bob Ross artist from the TV series The Joy of Painting. 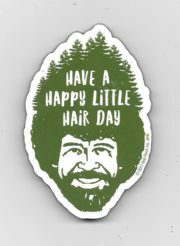 Underneath his image is his phrase “Happy Little Trees”. This is a new and unused glass stored in a smoke and pet free environment. 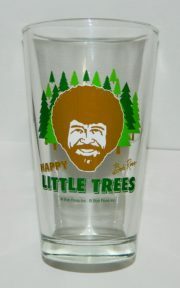 This is a new and unused 16 ounce clear pint glass with the art image of the late Bob Ross artist from the TV series The Joy of Painting. He has in his hair his phrase “We Don’t Make Mistakes Just Happy Accidents”. This is a new and unused glass. 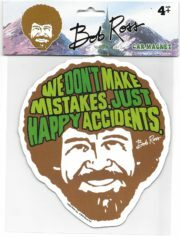 This is one of a series of licensed 2.5″ x 3.5″ magnets featuring various phrases and images from the artist Bob Ross and his TV series. New and unused it is stored in a smoke and pet free environment. 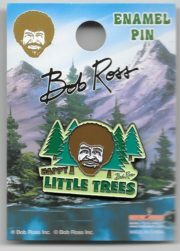 Produced by the Hot Properties, this is a licensed, metal enamel lapel pin of Bob Ross’ head, smiling surrounded by happy little trees and the phrase “Happy Little Trees” such as he drew on his show. This is a mint, unused lapel pin measuring 1.25″ x 1″. Produced by UPG, this is a quotable notables blank note card featuring featuring Bob Ross from The Joy Of Painting TV series. 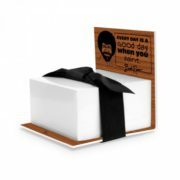 Why not get Bob Ross to deliver news of your latest gallery show with this handsome Quotable Notable card? On the back of the card is a mini biography of the tranquil artist, and in case you don’t have time to compose anything but your paintings, there’s also a sticker sheet of quotes and images, with cheerful greetings like “Congratulations!” and “I Love You!” This is a new, never used, note card still sealed in its original shrink wrap. Produced in 2018 this is a new and unused sticky note pad on a stand featuring an art image of Bob Ross beside his phrase “Every Day Is A Good Day When You Paint” on the front and above his signature. You’ll smile when Bob Ross is on your desk reminding you that “Every Day is a Good Day When You Paint.” This makes a great gift for the artists in your life! Premium white sticky note block adheres to the durable acrylic stand. Packaged with a bow, these useful desk decorations are a perfect gift for co-workers, employees, family and friends. 300 Blank Sticky Notes. Designed and fabricated in the USA. Refill cubes are available. This is a new and unused pad measuring 3.13″ long by 3.13″ wide x 3.13″ high. This is one of a series of licensed chunky magnets featuring various phrases and images from the artist Bob Ross and his TV series The Joy of painting. New and unused, it is made of composite materials and measures 2.5″ x 4″. This is a new and unused 11 ounce ceramic mug featuring and art image of Bob Ross, the late artist from the TV series The Joy of Painting. It has his phrase “Let’s Get Crazy” on it. This is a new and unused mug stored in a smoke and pet free environment. This is one of a series of licensed chunky magnets featuring various phrases and images from the artist Bob Ross and his TV series The Joy of painting. It is made of composite materials and measures 2.5″ x 4″. It is new and unused. 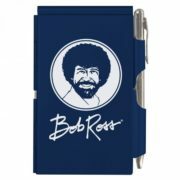 Produced in 2018 this is a new and unused metal flip note pad featuring an art image of Bob Ross and his signature on the front. Bob Ross reminds us to create and inspire! Flip Notes are handy for a quick note. You will never lose the pen because it holds the spring loaded Flip Note together. Slim and lightweight, these fit easily into a purse or pocket. Anodized aluminum protects the pad from bent edges. Each notepad contains 50 sheets of paper. Wonderful gifts for stocking stuffers, teachers, hostesses, and any occasion where a small gift is appropriate. Refill pads and replacement pens are available. This is a new and unused pad measuring 4.38″ long by 3″ wide x .35″ thick. Produced in 2018 this is a new and unused metal flip note pad featuring an art image of Bob Ross above his phrase “No Mistakes Just Happy Accidents” on the front. Bob Ross reminds us to create and inspire! Flip Notes are handy for a quick note. You will never lose the pen because it holds the spring loaded Flip Note together. Slim and lightweight, these fit easily into a purse or pocket. Anodized aluminum protects the pad from bent edges. Each notepad contains 50 sheets of paper. Wonderful gifts for stocking stuffers, teachers, hostesses, and any occasion where a small gift is appropriate. Refill pads and replacement pens are available. This is a new and unused pad measuring 4.38″ long by 3″ wide x .35″ thick. For a powerful thirst, gather your positive energy with this Bob Ross energy drink! Filled with 12 ounces of sweet liquid energy drink, Bob Ross knows how to put a positive spin on your day! This is an unopened 12 ounce (355 ml) illustrated can featuring the photo image from the popular cult TV series Bob Ross The Joy of Painting, and it is stored in a smoke and pet free environment. For a powerful thirst, gather your positive energy with this Bob Ross energy drink! 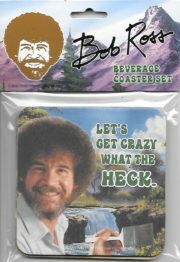 Filled with 12 ounces of sweet liquid energy drink, Bob Ross knows how to put a positive spin on your day! This is an unopened case of 12, 12 ounce (355 ml) illustrated cans featuring the photo image from the popular cult TV series Bob Ross The Joy of Painting, and it is stored in a smoke and pet free environment. Due to increased demand for this item and the time it is taking for us to restock, it is taking 5 days to process orders for the Bob Ross drinks ONLY! This is a new and unused licensed 500 piece jigsaw puzzle featuring the rich artwork of Bob Ross. This one is titled Summer and measures 12.5″ square when assembled. 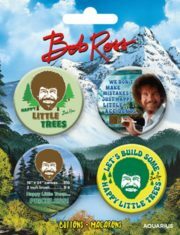 This is set of four 1.25″ wide round buttons that features images and phrases of the late Bob Ross from his TV series The Joy of Painting. They are attached to an illustrated card, are new and unused and are stored in a smoke and pet free environment. This is one of a series of licensed chunky magnets featuring various phrases and images from the artist Bob Ross and his TV series The Joy of painting. It is made of composite materials and measures 2.75″ x 4″. It is new and unused. 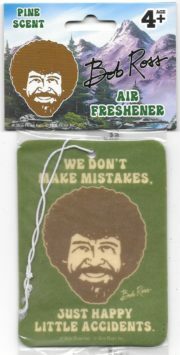 This is a licensed 3″ x 4″ air freshener featuring the art image of the artist Bob Ross and one of his famous phrases. It is new and unused. 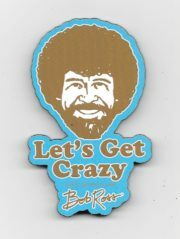 This is a licensed 6.25″ x 5.5″ vinyl car magnet featuring the artist Bob Ross and one of his famous phrases. It is new and unused. 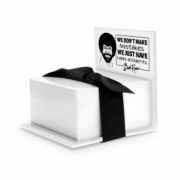 Produced in 2018 this is a new and unused sticky note pad on a stand featuring an art image of Bob Ross beside his phrase “We Don’t Make Mistakes We Just Have Happy Accidents” on the front and above his signature. You’ll smile when Bob Ross is on your desk reminding you that “We don’t make mistakes, just happy accidents.” This makes a great gift for the artists in your life! Premium white sticky note block adheres to the durable acrylic stand. Packaged with a bow, these useful desk decorations are a perfect gift for co-workers, employees, family and friends. 300 Blank Sticky Notes. Designed and fabricated in the USA. Refill cubes are available. This is a new and unused pad measuring 3.13″ long by 3.13″ wide x 3.13″ high. 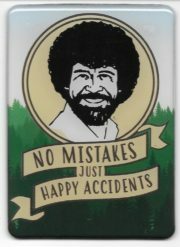 This is an 11.5″ x 8″ heavy grade tin sign that features a photo image of Bob Ross painting and his phrase “We don’t make mistakes. Just Happy little accidents”. These are produced in the style of the original tin signs that were common in the first half of the 20th century. It is a mint, never used sign, complete with pin holes in the corners for easy hanging and protected in shrink wrap. These also look very nice framed. 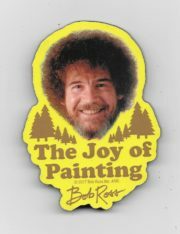 Produced in 2018 this is a peel off vinyl sticker that features an image and phrase from the popular cult TV series Bob Ross The Joy of Painting. This one measures approximately 4.25″ x 3.25″. It is new and unused. Produced by the Hot Properties, this is a licensed set of four photo and illustrated coasters each bearing a phrase made popular by Bob Ross on his TV series. They include Happy Little Trees, Let’s Get Crazy What The Heck, We Don’t Make Mistakes Just Happy Little Accidents and Let’s Make A Happy Little Accident. 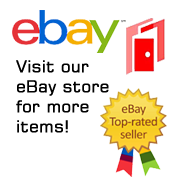 They measure 4″ x 4″ and are sealed in an illustrated package.